If you take pride in the beauty of your yard and and are looking for quality lawn care in St. Joseph Mo, then Triple T Lawn Care of St. Joseph Mo is the lawn care service you have been looking for. We have a full-range of St. Joseph Mo lawn care services which include mowing and trimming, pruning & edging bushes, irrigation maintenance and much more. Since landscaping, gardener and lawn care maintenance can be a homeowner’s most time-consuming job, let the lawn care experts at Triple T Lawn Care do it for you. Not all companies offering lawn service in St. Joseph Mo deliver consistent quality. You want a reliable company that can transform your bare yard into a wonderfully maintained fresh, green and budding lawn. Hire the capable hands of a local professional lawn mowing company to provide the lawn mowing services you need. Get in touch with us to get and get a free estimate. Then lets get going on giving you that landscape you have dreamed of. Triple T Lawn Care of St. Joseph Missouri has been servicing the greater Saint Joseph area since 2006. We are fully licensed and Insured. Our goal is to provide our customers with a single source for all of their lawn care and landscape maintenance needs. We will exceed expectations for quality, execution, and success. We at Triple T lawn care believe in developing long lasting relationships. In addition to the daily and weekly maintenance of caring for a lawn, we are also a landscape design service, a irrigation service, and offer a complete range of lawn care services. In today’s busy world, there is little time for gardening everyday which is needed to maintain the exterior of your home and property. You get very few hours of free time and the last thing you want to do is spend those hours doing yard care. Let us relieve you the burden of lawn care and maintenance. We service the Greater Saint Joseph Area as well as north Kansas City and Platte City Mo. Triple T Lawn Care has a staff of certified professionals to maintain grounds including weekly lawn maintenance, monthly chemical applications, and all of your landscape maintenance needs. From landscape design to irrigation design we discuss the finished project before we even start so that the project is exactly what you had in mind. All of our applicators are licensed through the state of Missouri and the EPA. We offer an ASE certified professional for your irrigation, fire sprinkler, or waste water backflow testing and certification. 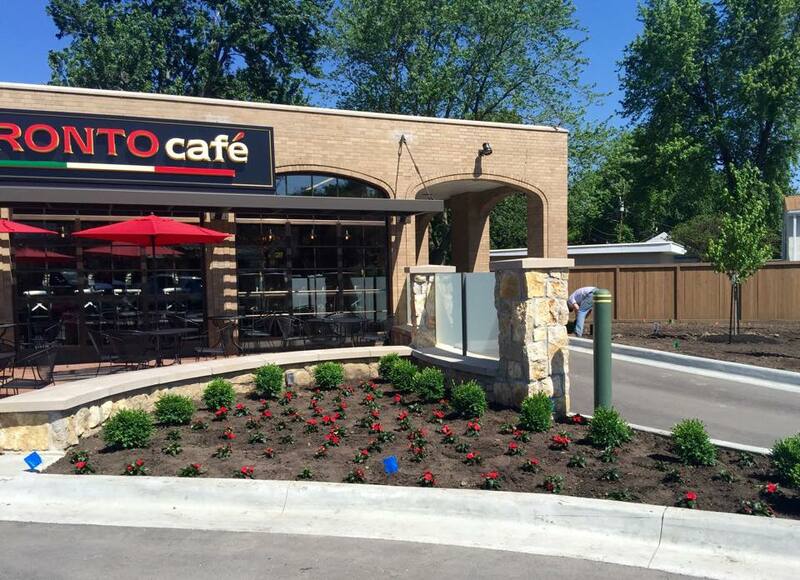 Our recent Landscaping Design At The Pronto Cafe St. Joseph Mo. Chemical Lawn Treatment include modern herbicides which are often synthetic mimics of natural plant hormones which interfere with growth of the target plants. The term organic herbicide has come to mean herbicides intended for organic farming; these are often less efficient and more costly than synthetic herbicides and are based upon natural materials. Some plants also produce their own natural herbicides, such as the genus Juglans (walnuts), or the tree of heaven; such action of natural herbicides, and other related chemical interactions, is called allelopathy. Due to herbicide resistance – a major concern in agriculture – a number of products also combine herbicides with different means of action. Commercial Lawn Care or Groundskeeping is the activity of tending an area of land for aesthetic or functional purposes; typically in an institutional setting. It includes mowing grass, trimming hedges, pulling weeds, planting flowers, etc. The U.S. Department of Labor estimated that more than 900,000 workers are employed in the landscape and groundskeeping services industry in the United States in 2006. Of these over 300,000 workers were groundskeepers for golf courses, schools, resorts, and public parks. Landscape design (or groundskeeping) is the art and vocation of keeping a landscape healthy, clean, safe and attractive, typically in a garden, yard, park, Institutional setting or estate. Using tools, supplies, knowledge, physical exertion and skills, a groundskeeper may plan or carry out annual plantings and harvestings, periodic weeding and fertilizing, other gardening, lawn care, snow removal, driveway and path maintenance, shrub pruning, topiary, lighting, fencing, swimming pool care, runoff drainage, and irrigation, and other jobs for protecting and improving the topsoil, plants, and garden accessories. Lawn Irrigation sprinklers are sprinklers providing irrigation to vegetation, or for recreation, as a cooling system, or for the control of airborne dust. The sprinkler system irrigates the field and thus it is widely used in sandy areas as it checks the wastage of water through seepage and evaporation. Sprinkler irrigation is a method of applying irrigation water which is similar to natural rainfall. Water is distributed through a system of pipes usually by pumping. It is then sprayed into the air through sprinklers so that it breaks up into small water drops which fall to the ground. The pump supply system, sprinklers and operating conditions must be designed to enable a uniform application of water. Quality Lawn Care in St. Joseph Mo. Quality lawn care is one of those features that helps define suburbia. Large swaths of neatly-cut grass aren’t typically a dominant characteristic of the big city landscape, but lawns sure seem important in the ‘burbs. And the greener the better. Residential Lawn Service in St. Joseph Mo. Residential Lawn Service requires a wide range of knowledge of horticulture, pest control, and weed abatement. As many institutions (especially schools) are moving away from the use of chemical pesticides and toward integrated pest management the experience, knowledge and scholastic requirements of top groundskeepers are increasing. While groundskeepers usually follow a site plan created by a landscape architect, there can be many opportunities for creativity in detailed design and presentation. Snow Removal Services in St. Joseph Mo. A snowplow used in Snow Removal Services (also spelled snow plow, snowplough or snow plough, see miscellaneous spelling differences) is a device intended for mounting on a vehicle, used for removing snow and ice from outdoor surfaces, typically those serving transportation purposes. Although this term is often used to refer to vehicles mounting such devices, more accurately they are known as winter service vehicles, especially in areas that regularly receive large amounts of snow every year, or in specific environments such as airfields. In other cases, pickup trucks and front end loaders are outfitted with attachments to fulfill this purpose. Some regions that do not frequently see snow may use graders and other equipment for this task, but graders are nonetheless the best equipment to remove compacted snow and ice off the streets. Snowplows can also be mounted on rail cars to clear railway tracks. Lawn Care St. Joseph Mo.